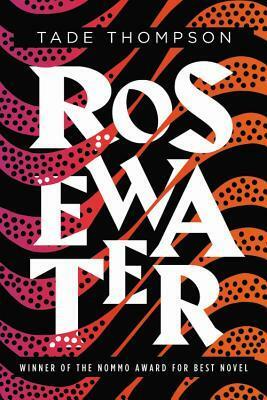 "Tade Thompson's Rosewater is the start of an award-winning, cutting edge trilogy set in Nigeria, by one of science fiction's most engaging new voices. Kaaro is a government agent with a criminal past. He has seen inside the biodome, and doesn't care to again—but when something begins killing off others like himself, Kaaro must defy his masters to search for an answer, facing his dark history and coming to a realization about a horrifying future." This was a fascinating book! However, this has proven to be a difficult review to write because it's hard to fully explain how things in this world work without writing pages and pages of information, but I'll do my best to discuss the structure itself and give you an idea of what to expect. Rosewater is one of those books where the reader is thrown into things without a lot of explanation. As the novel progresses, the author slowly unfolds more and more information about both what is occurring in the present timeline as well as what occurred in the past that has built up to present events. I'm often mixed on my opinion of books that throw the reader into too much without providing much background information about anything that's going on, largely because I then often find myself focusing too much on being lost and not the story itself--but not so in this case. To prevent this, Thompson feeds the reader just enough information to keep them grounded without ever giving away too much or overwhelming the reader. Even though I felt a bit confused or uncertain at times, I was surprised at how sucked into this story I was--I didn't want to put the book down, and whenever I did I was yearning to pick it back up again and find out hat was going on in this crazy story. The protagonist, Kaaro, is the sole perspective to tell the story, which I was very thankful for--sometimes I just get tired of multi-perspectives in fantasy and sci-fi an prefer to stay with one person. However, the chapters do alternate between various times in Kaaro's past and the present, and it is done so in a way that melds together really well and lets the story unfold at solid, steady pace. Kaaro is a character that I really grew to love throughout the story. He first came across as someone who is a bit indifferent to the world around him, but as the story gained momentum and more about his past and current life were explored, his personality really started to show through. He's someone with a rather dry humor that adds subtle personality to an otherwise potentially mundane world; he's both reckless and careful, which makes for a thrilling combination. Thompson's writing style is what I think made this book the most engaging for me. It's mostly a rather blunt, simple style, but it has a certain amount of deftness and precise storytelling that makes it something surprisingly compelling. I could never quite put my finger on what it was about this book that made it so captivating, but Thompson somehow continuously touches on deep, thoughtful topics in a simple way, then sprinkles in a bit of dry irony or humor and suddenly I'm glued to the pages. He can take the complicated and write it in a simple way that is excessively readable. I also really liked the detail that was seemingly paid to each and ever word and sentence in this book. I felt as though there were a lot of very subtle references, metaphors, or other meaningful phrases and ideas that were quietly sneaked into the book. As I mentioned before, the pacing was really well done. There's enough intensity to keep the reader engaged, but it also moves at a somewhat slower pace at times that gives the reader a chance the get their bearings and better understand what is going on. There was no excessive info-dumping, but I always felt as though I had enough information at each given scene. The last third or so of Rosewater really picked up speed and that was where things really started to get crazy. I did find myself feeling a bit lost at various points near the end, but I can't tell if that was just me or if other people might also find themselves a bit confused and it was purposefully that way. Despite that, the ending was still extremely well done and has left me dying for a sequel. Overall, I've given Rosewater 4.5 stars! I was so close to giving it five stars and there is a high likelihood that after I eventually re-reading this I might just raise it to that five. Really like the sound of the writing style- sounds excellent. Great review! It really was, very compelling. Thanks! I loved this too! I think Thompson is an excellent writer and I'm looking forward to his next book. And I agree, I think he did the non-info dump thing really well, not all authors can pull that off. It's hard to find authors that can pull it off well, I agree. I'm so glad Thompson did it so well because the concept is so interesting. This sounds very cool! I'm drawn to simpler writing styles, so that appeals to me.